Wi-Fi Technology Ruler Work Feature and foot included. Elna's all new top-of-the-line sewing, quilting, and embroidery machine will help you achieve any sewing task. Create embroidery like never before by utilizing this machines 350 built-in embroidery designs, 10 fonts for monogramming,and a 2 and 3 letter monogramming function. With four different hoop sizes, and a 1000 stitch per minute maximum speed, this machine allows for larger and faster embroidery work. Quilters and sewists will enjoy choosing up to 400 stitches and 13 one step-button holes. The expansive bed space also makes the eXpressive 920 perfect for quilting, home decor,or any other project where added sewing space is a must. Choose from 250 different stitches and 11 buttonholes. The Skyline S9 has 250 built in designs that give you a wide range of styles and motifs for all kinds of projects. Included are 40 exclusive designs from Anna Marie Horter, 20 different fonts for monogramming and 48 border designs. 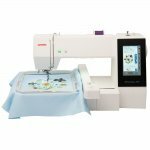 The Skyline S9's built-in Wi-Fi capabilities make it easy to transfer designs, fine tune embroidery placement and monitor your stitching. With Janome's collection of apps, you can edit and monitor your embroidery from anywhere. The time spent behind your sewing machine is some of the most precious, so you deserve a machine that let's you get the most out of it. Created with special, easy and time-saving features, the Horizon Memory Craft 9400 is unlocking limitless possibilities for quilters to escape into a world of pure creativity. Quilters now have a full 11"of bed space to the right of the needle to store extra fabric from a quilt. In addition, quilters can enjoy exceptionally smooth quilt piecing with the with the included Acufeed Flex Layered Fabric Feeding System; achieve faster performance with a sewing speed of 1,060 SPM and view their work, shadow-free with the machine's retractable High Light Navigation through all of these features has become easier with the MC9400's new LCD color touchscreen. Now designers can create projects to reflect their personal style. It's easy to personalize, embellish and monogram. 160 built-in designs and 6 fonts for monogramming. Large scale designs to tiny designs.. This machine is the ONE...... and comes with 4 embroidery hoops. Designs are easily imported through a USB. Navigate through all options with easy LCD color touchscreen. arc combine, copy and paste, grouping, corner layout, single color sewing, zoom. • Direct jump to desired stitch point• Auto return post thread break• Adjustable hoop positioning• Built-in advanced needle threader• Automatic thread cutter• Easy set bobbin• Bobbin winding plate with cutter• Bobbin thread sensor. The MB-7 is the perfect tool to help you conquer your next embroidery project. This innovative machine is built to work with multiple formats such as jef+, jef, and .dst. With 50 built-in embroidery designs and 10 fonts for monogramming, a USB port to easily import designs and a maximum speed of 800 SPM, the possibilities are endless. All embroidery operations are noticeably faster and smoother on the MB-7. You will be impressed with the projects professional finished result.